World Basic Income (WBI) is a campaign organisation with a proposal to achieve greater social justice through the provision of unconditional cash transfers. World basic income differs from national-level basic income initiatives in that it would gather money at the global level, and distribute it to every person worldwide. While STWR does not necessarily endorse all aspects of the following proposal, we support its basic rationale that the earth is a common treasury for all, and the time has come to end poverty as a foremost priority by sharing resources internationally. The selected articles below are republished from WBI's introductory pages, and STWR will contribute our perspective to this debate at the World Basic Income conference in Manchester on 4th February 2017. Why give a basic income to well-off people? Many people are able to earn enough money to cover these essential human needs, and governments should, and in many cases do, provide some or all of the necessary support. But there are many more people whose work opportunities and governments are not adequate to ensure that enough food, clothing, housing, medical care and other essentials are provided. This provides us with three choices. Firstly, we can ignore the human rights of these people. This has happened throughout history, and it continues today. Secondly, we can try to provide the exact goods that people need. Many aid programmes and charities attempt this. Careful assessments are made of what is lacking in each area, and people are given the goods they are thought to lack - anything from rice to tin roofs to mosquito nets. This can be very effective and many lives and livelihoods have been saved in this way. However, there are also many issues involved in providing goods. How can we be sure what people need? There is not time to ask each person what they lack, so people are usually given the same or similar items. This can be wasteful, and can fail to meet people's needs. Some people in a target area might already have a mosquito net or enough rice, but they don't have soap or blankets, and keep getting ill for this reason rather than because of malaria or malnutrition. No amount of mosquito nets or rice would help to fulfil their human rights in this case. Next, how can we reach everyone? The careful targeting to find the most in-need communities, the assessments of needs, and the shipping and distribution of goods are all time-consuming processes requiring well-paid experts. Inevitably, many communities are left to get by without help. And there are many further complications too. If goods are brought in and handed out for free, will local farmers and shopkeepers be under-cut and go out of business? How can goods be provided safely so that people are not put at risk from thieves? How can people show up at a collection point regularly, if they need to be at work or looking after their family? Given these issues, it begs the question - is there a better way to provide for people's human rights to life and sustenance? Thirdly, we can provide people everywhere with money, so they can decide for themselves what they need for their own life and sustenance, and get hold of it in the way that works best for them. If this was done as a universal whole-world scheme, this would be a world basic income. Unsurprisingly, this is the way that we at World Basic Income believe our human rights should be secured. Despite the lofty intentions of the global community following World War II, fulfilment of the UN Declaration of Human Rights has been patchy. Some rights, such as Article 5 which prohibits torture, and Article 14 which gives the right to asylum, are the basis of major international action and agreements. Many other rights are sorely neglected. It doesn't need to be this way. The world is now rich enough that no one need be denied their fundamental human rights, while UN Declaration of Human Rights gives us a mandate for action. We have agreed what we all need in order to live decent lives. Food, clothing, shelter and medicines are essential for life, and money is the simplest means by which we can secure them. It is time to take action to secure these rights for ourselves, by putting in place a world basic income. In our world economy at the moment, inequality is soaring, with the wealthiest 1% gaining an ever-growing share of total wealth. The Global Wealth Report 2015 states, "We estimate that the top percentile now own half of all household assets in the world," while Oxfam report that the world's 62 richest people own as much as half of the world's population put together. In the world economy, there are many mechanisms that transfer wealth upwards, towards those who already have quite a lot of it. Rent is taken from tenants and passed to landlords. Profits are created by workers using natural resources, and are distributed among shareholders. Interest is taken from those who are forced to borrow money, and given to those rich enough to have money in the bank. Some tax regimes take a large proportion of income from people on low incomes, while taking little from the well-off. Even markets tend to favour the richest, with discounts for bulk purchases, and high transaction costs for those with the least. These mechanisms send wealth up the economic pyramid. Other mechanisms bring wealth back down the pyramid. These include wages and salaries paid to workers, spending by rich people and companies on goods provided by poorer people and companies, progressive tax regimes, pro-poor public spending and social security. But many of these mechanisms are under attack or in decline. Trends in inequality suggest that these mechanisms for 'trickle down' are not enough. To keep an economy stable, these mechanisms need to be in balance. ​Without enough ways to bring wealth back down, more and more of it will end up in the hands of a tiny number of people. The rest of us are left fighting over the crumbs. Many people, including us at World Basic Income, believe that extreme inequality is unjust and problematic. We believe the economy needs to be re-balanced, with more mechanisms to bring wealth back down the pyramid, dynamically re-capturing it from the top 1% and sharing it amongst the rest of us. We believe that a world basic income provides an ideal direct mechanism for doing exactly this. It gathers wealth from places where there is too much and re-distributes it to everyone, all over the world. We can vary the amount collected and redistributed, to adjust inequality to the level we feel is right. No other mechanism so directly addresses world inequality. ﻿The extreme inequality of the modern world poses many practical problems, but it is also the manifestation of historic injustices that have deprived most people of their fair share of the world's natural and collective wealth. Once, the earth and its natural resources belonged to all of us. Over time, and usually with much violence, people began to enclose land and declare ownership over it. Our rights to travel, to build homes, to gather food and firewood, to graze our animals, to have space to be buried after our death - these rights were, deliberately or inadvertently, taken away from us. Now, most of us are obliged to pay someone else for the ability to do these things. Other kinds of property are not naturally occurring, but many people believe they should be thought of as collective goods, as their creation is the result of thousands of years of combined human efforts. Intellectual property - everything from medicines to seeds to computers - is thought by many to fall into this category. It feels fair to pay others for work that they do for us, but to pay for access to land and natural resources that simply exist seems unfair. Similarly it seems odd that a few people are able to charge us so much for using intellectual property that our own ancestors may have helped to create. But of course, most of today's owners of land, natural resources and intellectual property also paid for them - they bought them from the previous owners, who bought them from the owners before that. In practice it would be extremely difficult, and in many cases unfair, if we were to now declare everything to be common property. How then can we recognise people's rights to share in the wealth of the world? A world basic income could provide an answer. Another name for basic income is the 'universal dividend', which reflects this idea of common ownership and sharing of proceeds. These ideas are radical, but with inequality as extreme as it now is, we need to begin thinking beyond the old solutions. It is our world, and our wealth - why not invent decent solutions to make the best use of it? A world basic income is likely to be introduced at a fairly low level (although the aim would be to increase it over time as income streams open up). Therefore the greatest impacts on poverty will be for the billions of people who are currently struggling by on very low incomes. Starting small businesses, in brick-making, baking bread, and dress-making. Healthcare - basic income enabled people to pay the N$4 (18p) clinic fee. Paying children's school fees of £2.30 per year. The poverty rate fell from 76% of households to 36%, and fell to just 16% of households not affected by inward migration (the improved circumstances of people in Otjivero-Omitara led family members living elsewhere to move in with them, spreading the basic income more thinly within the household). The proportion of people involved in income-generating activity rose from 44% to 55%. Child malnutrition rates fell from 42% to 10%. There was a 36.5% drop in crime, and alcohol consumption did not increase. More and better food, including more vegetables, pulses, eggs and fish. Medicines (women especially felt able to spend on medicines, rather than relying on 'home remedies'). Seeds, fertilisers and livestock for their own farms, increasing their productivity. Avoiding debt - by the end, 78% said their indebtedness had reduced. The proportion of households reporting that they could afford enough food went from 52% to 78%. The majority of households said they had noticed an improvement in their health, from being able to buy medicines when needed, from eating better, and from reduced anxiety. Fewer families had to get into debt to pay for health expenses. 66% of girls in the basic income villages were in secondary school by the end of the pilot, compared to just 36% in the control villages. Families were also able to increase their earned income, with 21% reporting an increase in work activity. Women gained more control within the household in basic income villages. By the end of the experiment, 54% of women said income was shared equally in their household, compared to 39% in the control villages. The UK's Department for International Development write, "Economic growth is the most powerful instrument for reducing poverty and improving the quality of life in developing countries." Growth in world production certainly can bring benefits for the poor, but there is strong evidence that because the poorest people benefit the least from economic growth, this alone will not be able to end poverty. We will also need to adjust the way that income gains are distributed if we want to ensure no one lives in extreme poverty. An analysis by UNCTAD's Senior Adviser for Africa, Least Developed Countries and Special Programmes looked at how much the world economy would have to grow in order to raise everyone in the world to the still-very-low income of at least $5 per day. It found that world production would need to increase to 173 times the current level, and world GDP would need to reach $1.36 million per person. These figures are staggering. The quantity of natural resources that we would need to produce 173 times as much goods and services as we do today, every year and continuing forever, is clearly not going to be available on our finite planet, and the carbon emissions generated by producing even a fraction of the energy required would cause enormous climate change. It also seems unlikely that the average person could even manage to consume $1.36 million worth of goods every year, which they would need to do if this imagined economy is to come about. These figures show that simply growing the world economy, while allowing the poorest people only the same proportion of income growth as they have receive in the last couple of decades, is not a workable strategy for tackling poverty. We need to tackle the distribution of wealth and income, to make sure that our very high and growing levels of world production actually translate into a better standard of living for those who need it most. The evidence shows that this does not happen on its own - we need deliberate interventions to shift income distribution away from the already well-off, and towards the poor. World basic income is one such intervention, which could redistribute world income in the right direction. The existence of poverty in the world is a choice. It is absurd to suggest that a world which can sequence the genome and construct supercomputers cannot also invent a social system in which no person must live in degrading conditions. Many of the solutions to poverty are already well-known. Strong labour movements, access to land and resources, fair trade rules, decent infrastructure spending, comprehensive public services, and free civil society - all are essential and effective tools we have used to combat poverty and secure decent lives for ourselves. All these are still very much needed, and World Basic Income will gladly work in partnership with organisations that seek to secure them. But we can continue to innovate and design new features for our social system that go even further. We can choose to combat income poverty directly, by simply distributing money directly to everyone, guaranteeing a fairer share of world income for those who otherwise miss out. In our current economic system, most of us earn a living by having a job. Without the money we earn at work, we would quickly find ourselves unable to pay for basics like food, housing and bills. Meanwhile, businesses need customers who have enough money to buy their goods. Without enough customers they have no source of income, so would make no profits for their investors, nor could they afford to pay their workers. If lots of us lacked jobs at the same time, we couldn't buy most of the goods produced, and the economy would grind almost to a halt. Our economic system works relatively well if the production of goods and services needs lots of human workers. Throughout history, most tasks have been fairly labour-intensive. Farming used to employ most of the population, until new machines and technological systems reduced the number of workers needed. These people were then needed in factories, where the machines needed human operators. As time has progressed, more and more efficient machines have been invented, which need fewer humans to produce each unit of output. Information-based aspects of production now need fewer workers too. Producing photographs used to take thousands of employees to manufacture and develop camera film; now digital cameras and web-hosted services allow us all to hold thousands of photographs using hardly any human labour. Calculating paychecks for workers used to require armies of accounting clerks - now the task can be done by just a few people with a database or spreadsheet. Other jobs in the service sector are being replaced too. Self-service checkouts are now common in supermarkets. Driverless vehicles are on teh horizon, potentially making millions of lorry drivers, taxi drivers and train drviers redundant. McDonalds is even proposing replacing the workforce iwth robots in order to cut staff costs and boost profits. As technology continues to develop, there may be few sectors left that need large numbers of human workers. And for any jobys that do still need people to do them, an income stream must be found to pay the wages. Items and systems that can produce goods and services are known as the 'means of production'. As the means of production become increasingly hi-tech, the owners of them (including shareholders) can produce and sell goods and - becasue they don't have to pay many workers - pocket most of the proceeds. This is happening all over the world, and hi-tech production affects even those who still work in labour-intensive indudstries, through its impact on prices and competition. As machines replace workers, how can we earn enough to buy things? In many ways, these technological developments are great news for humanity. Mass production has helped to ensure that there is enough food, clean water, warm clothing, building materials, energy, medicines and consumer goods for everyone in the world. And far fewer of us are needed to do repetitive and back-breaking work to create these things. Yet many economists and analysts have identified a problem. As humans become barely needed to produce essential goods and services, how will people earn a living and have enough money to be customers? And when people do manage to be customers, and their money is passed to the owners of the machines that made the things they bought - to factory owners, app designers, and company shareholders, who hardly have to pay any of that money back out as wages - how can that money filter back into the economy again to keep production flowing? Even if there are many people wanting goods and services, and many people willing to work to provide them, if we do not tie these wishes together as jobs, our human needs for sustenance cannot be met. New consumer needs have appeared (or been created through advertising), and either government-run or private sector businesses have employed workers to fulfil them. This can be great - more healthcare, computer classes, hiking holidays and massages probably improve our lives and represent a good use of human effort. Telesales, alcohol marketing, and the manufacture of shoddy goods represent less positive solutions to our jobs dilemma. Either way, money still has to be found from the general economy to pay the wages of these workers, and there are still likely to be economic pressures to replace workers with machines. As time goes on, will there be enough jobs left for all of us? Create extra money and insert it into the economy so people can buy things. New extra money has been added in to our economy for centuries by banks and governments. Banks create almost all of the money in existence through offering credit - it pings into being when people spend on credit cards and take out loans - while governments use 'quantitative easing' to pump funds into the economy. This can work well for a time, but problems can arise when the debts are due. If we pay back the debts, the money is effectively un-created, reducing the amount of spending power in the economy and returning us to the original problem. If people and governments do not pay back the debts, financial markets 'lose confidence' and crashes occur. So money creation seems to only delay the problem, rather than solve it. Redistribute money from where it accumulates, back into people's pockets. Governments have been doing this for decades, through taxation and public spending. Most economic activities, including earning wages, selling goods, and making a profit, are taxed by governments. Governments then spend this money, mostly on paying people to do jobs - everything from teaching to social care to road maintenance. ​This gets (mostly) useful work done, and provides jobs for many people, who then have money they can spend on goods produced in the private sector. But spending on public services alone may not keep enough money circulating to be a solution on its own. The three methods discussed above all keep money flowing so that people can buy the items they need to live. Employing workers in new sectors can be positive, but there's a risk as time goes on that we may be forced to create pointless jobs, just so people have an opportunity to earn. Creating money in the form of credit or quantitative easing seems to work only as a temporary fix, and risks financial crashes. Redistribution by governments, through taxation and public spending, is an essential part of our public life that brings many benefits. However, if this were to become the main way in which we keep money flowing, it puts a huge amount of decision-making power in the hands of a relatively small number of politicians and civil servants. It is difficult for a single central organisation like a government to know what every person in the country most wants and needs - this often works well in sectors where we tend to all want the same things (excellent healthcare, reliable public transport, regular bin collections) but less well when we want different things (most people would rather choose their own food, clothes, books and leisure activities). Sometimes, the best people to decide what goods and services they need are the people themselves. Basic income is a kind of tax-and-spend that governments could use, alongside spending on public services, to collect up money from where it accumulates (which is increasingly with those who own hi-tech means of production), and redistribute it to us all directly to spend as we see fit. In the same way, a world basic income could collect up a proportion of the immense wealth that circulates at the global level, much of which barely touches-down in national economies at all. The owners of hi-tech means of production (which includes all businesses which use machines and computers to replace human labour, i.e. most businesses) often keep their money offshore, in high-secrecy bank accounts and by buying up assets in far-away countries. National governments often struggle to keep track of these money flows, and therefore they are not always able to tax them effectively or sufficiently. This can especially affect governments of newer democracies, who may lack the political will or the expertise to compete with aggressive tax avoidance by corporations and the wealthy. A world basic income scheme could tap into the immense amounts of money that flow around the world between corporations, tax havens and the super-rich, and extract a share of it to distribute among people all over the world. People in poor areas, to which practically none of this global money currently flows, would have access to an entirely new basis for prosperity. We would have the basis of an economic system that could thrive rather than suffer from the ever-growing development of technology. World basic income differs from national-level basic income in that it would gather money at the global level, and distribute it to every person worldwide. Ideally this would be in addition to basic incomes provided in each country by national governments - 'as well as', not 'instead of'. Achieving change is not easy, and as basic income campaigners we all have a long fight ahead of us. It may take many decades, and some national governments may still refuse to introduce national basic incomes in their countries. Without other decent social safety nets, residents of these nations may continue to live without basic income security for decades or even centuries to come. And given that in 2015, one in ever 122 people in the world was internally displaced, seeking asylum or a refugee, it may be unwise to rely only on schemes that operate at the national level. People are often most vulnerable when they have to leave their homes. Universal worldwide coverage of basic income would provide security when people are slipping through the cracks of other kinds of help. A world basic income may be just as difficult to achieve politically, but the potential pay-off is huge. It could provide a thorough safety net for every person in the world, preventing us all from falling into extreme poverty. Malnutrition, illiteracy and destitution could be wiped out, simply by people having access to a modest regular share of our world's wealth. Every person would have the means to start a small business, employ a neighbour to fix their roof, buy antibiotics for their child. These are basic human rights that are currently denied to billions of people throughout the world, in rich countries as well as poor ones. A world basic income could guarantee these rights for us all. World basic income provides the ultimate form of security. Even if your country is run by a despot, ravaged by war or disaster, or suffers economic collapse, you would still receive your world basic income. No matter who you are or where you are, a world basic income could provide us all with the means to buy food, water, transport to escape danger, or a roof for the night when we need it most. 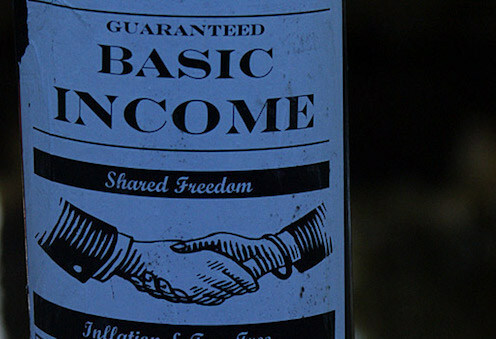 A world-level basic income scheme is a relatively new idea. Although organisations like the United Nations have existed for many years, we don't have world level taxation and benefits programmes in the way that many national governments do. This means that there are few mechanisms to even up inequalities between countries, or to redistribute income from global elites back to the wider population. It is estimated that around 75% of the difference in wealth between any two people in the world will come from inequalities between the countries in which they live. No matter how hard a person works, or how much they study, or how wisely they invest, most people in low income countries won't be able to earn a decent income, and many will have no way out of enduring poverty. World economic systems (which have usually been designed by elites) tend to direct wealth upwards, where it circulates among the well-off. It is usually only through deliberate political action, demanded and enforced by the people, that we can re-capture the wealth that we create. World basic income could be a political action that we begin to demand, as a way of re-capturing a better share of global wealth for all of the world's people. The mantra 'think global, act local' is useful in reminding us that we should all do what we can do, in whatever spheres of influence we can access, to make our collective lives better. Local or national actions, including smaller-scale basic incomes, are extremely valuable and in many many cases, working in the arena you know best will be the best way to achieve positive change. However, for most people who care about others, that sense of solidarity doesn't stop at the border. If we had the opportunity to share positive change more widely, and work with our sisters and brothers around the world to make things better for all of us together, we would take it. Campaigning for a world basic income is a way that all of us, from any country or background, can speak together and demand our fundamental human rights. We can insist that in some matters, such as our basic needs for survival and our desire to live a dignified life, we are all one. The world is rich and we are smart enough to put men on the moon. It is time to choose to move forward with no one left behind. When hearing about the proposed world basic income, a question that often arises is 'Why include people and countries that are well-off?'. Some advocates of cash transfers prefer 'targeted' rather than 'universal' approaches, as theoretically people living on low incomes can then be given more money. However, there are several reasons why it might be better to provide a world basic income to every person, rich or poor. World basic income is not aid, nor is it charity. It is a form of global redistribution, sharing out wealth in a way that we believe is fair, reasonable and civilised. There might be good arguments that the very poorest people have evidently had the worst deal from the global economy, and therefore are the most deserving of transfers. However, providing transfers only to poor people or countries is likely to change the way we see world basic income in the long run. The longest-lasting and best defended public goods tend to be those that are available to everyone, as people then see it as their right to access them. Britain's National Health Service (NHS) is a prime example. Every UK resident can use the full health service for free, even if they are rich enough to pay for private health insurance. This helps British people to consider free healthcare to be a human right, and they defend the NHS very strongly in political arenas, to the extent that even the most right-wing politicians don't dare to attack it. We want a world basic income that lasts, and this requires people to see it as an essential human right, and to defend it as such. All rich and middle-income countries contain some poor people, including a shocking amount of people who are utterly destitute. Being poor in a well-off country can be just as bad or even worse than sharing the same very low income bracket as your friends and neighbours in a low-income country. The complicated and conditional social security systems that exist in most countries allow vulnerable people to slip through the cracks. Even at the very low starting level of £7 per person per month that World Basic Income is suggesting, people in the worst of circumstances are likely to feel the benefit, wherever they live. If in doubt, ask a struggling single parent with four children in a well-off country whether an extra £35 per month would make a difference to them. You may find few that would say no. Why assume that the funding for WBI must be meagre? At World Basic Income, we propose that the scheme should be funded by tapping into global wealth streams that have not previously been accessed for public benefit. These streams of wealth are immense, and they belong primarily to the very rich. The funds that we tap from these sources may be meagre at first, but they need not stay that way. Social movements may, in time, be able to demand that meaningful amounts of this wealth are shared out among the world's people. It is our world, and, in many ways, our wealth. Why not demand a fairer system to share it? Most well-off people are likely to have some stake in global wealth flows, for example by benefitting from world currency trading and shareholding through their pension. Very well-off people are likely to have a large stake, by holding shares in global businesses, offshore bank accounts and so on. Every form of redistribution has winners and losers, and in the proposed world basic income scheme, these individuals are likely to lose rather more than their £7 a month through new forms of global taxation and fees. Therefore they need not feel guilty about receiving their monthly basic income. And if anyone thoroughly objects to receiving it, they can of course fail to register for the scheme, leaving the money in the pot for distribution to others. As soon as you draw boundaries between who can and cannot receive a benefit, bureaucratic systems must be built up to police them. Armies of world civil servants would be needed to assess each individual's income level and reassess it every time their circumstances changed. Or if access to world basic income were decided on a country by country basis, rules would be needed to decide whether immigrants and emigrants still qualified, and even during wars or mass migrations, border police would need to collaborate closely with the world basic income authorities to ensure non-residents were not benefitting. Courts, clerks and bailiffs would be needed to impose penalties if people failed to report changes or falsified information. And just as with existing social security systems, large amounts of money would be lost in administration and enforcement costs, while many of the most vulnerable people are likely to miss out entirely. The safety net would be, once again, full of holes. To achieve a world basic income that is non-bureaucratic, easy to access for the most vulnerable, and well-defended in the world political arena, we believe that it should be available to everyone, regardless of income, nationality or country of residence. Although the road towards this may contain a number of non-universal schemes, for instance large-scale pilot experiments, or phased implementations, we see these as steps along the way. The ultimate goal - the goal we will continue fighting for, until it is achieved - is a true world basic income, that supports us all to secure our human right to life. Basic income proposals and pilot projects have varied enormously in terms of how much money is provided per person. These proposals can be divided into three main categories: full basic income; partial basic income; and survival basic income. Some basic income campaigners focus on the increasing automation of production, and the opportunities this provides to re-think the relationship between work and income. Activists note the coercive pressure that currently sits at the heart of employer-employee relationships - most of us know that we cannot stop working, even if what we're doing doesn't feel intrinsically valuable, as we would lose our only source of income. The full basic income aims to be high enough that you could live on it comfortably without working, and therefore the work you do will be freely chosen and truly motivated. Basic Income Switzerland, for example, proposed a monthly amount of around £1,800 per person. Funding models vary, but the intention tends to be that your basic income would replace a part of your work salary, or it would replace your welfare benefits or pension if that is how you earn your living. Changes in the taxation of employers, sales and other areas would provide the money to pay these high rates of basic income. Other campaigns tend to focus on the injustice, indignity and inefficiency of existing social security systems, the potential for exploitation of low-paid workers, and the rights of everyone to basic survival. In this vein, the UK Green Party proposed a basic income of £80 per person per week (£347 per month), with supplements for single parents and people with disabilities, and the continuation of housing benefits to prevent homelessness. This level of basic income is intended to give people the freedom to leave bad jobs, or campaign with more leverage for better treatment; to study or re-train without getting into debt; and to be free to work part-time or not at all while raising children, caring for others, or pursuing other interests. Such proposals often aim to be cost-neutral, by using basic income as a replacement for existing benefit expenditures, tax allowances and tax caps. Around one in every nine people on earth does not get enough to eat. Around 45% of young child deaths worldwide are caused by malnutrition. Paying for clean water, clothing, basic medicines, school books and farm tools can be almost impossible for millions of families. Some basic income proposals and experiments have focused on improving the standard of living for those who get the worst deal in the world economy. Cash transfer programmes for Haitian earthquake survivors and Syrian refugeeshave given amounts of £80 to £100 per household per month, while pilot basic income projects in India and Namibia have given between £1 and £5 per person per month. These small amounts have often made big differences - hunger and ill health are reduced, school attendance and community cohesion improve, women are empowered and local economies flourish. Although of course a larger basic income is likely to bring even greater benefits, actual implementation of even a small world basic income could be transformative for billions of people. How much should we get as a world basic income? The priorities expressed in all of these levels of basic income are important. Freedom matters, and everyone deserves a decent standard of living. Obviously, the higher the basic income, the better these ideals can be achieved. However, if we want change in the world in the forseeable future, we need to create proposals that are politically feasible. Funding a world basic income means opening up new income streams that tap into global flows of wealth - this is likely to be highly controversial, and may well be resisted by powerful people and organisations. The more money we need to raise, the stronger this resistance is likely to be. And before we can campaign convincingly for a full or even a partial basic income, we need further evidence as to their economic impacts. How do they affect work patterns and productivity? Do they cause inflation or deflation? Are the funding burdens falling on the right people? We need to know that a world basic income will actually improve people's lives, without causing problematic unintended consequences. These questions need answering for any level of basic income, but the practical and political risks of introducing a survival basic income are much lower. Pilot experiments have already demonstrated excellent outcomes and an absence of unintended problems. Funding this level of basic income is, of course, much easier too, and the moral, political and economic justifications for it are difficult to resist. Therefore, we at World Basic Income will begin by campaigning for a survival-level world basic income of US $10 per person per month, equivalent to about £7. ​This is a starting figure - we may amend it upwards or downwards in light of research and experience, and we hope that it would be only an introductory amount, and could be raised significantly once introduced. Ultimately, the level will of course be determined by the demands of world civil society and the degree to which they can push these demands through. We will be delighted to campaign for a higher level of basic income should the opportunity arise. At World Basic Income, we believe the amount received should not vary according to average incomes or prices in each country. If this amount is too low to be meaningful in better-off countries (as no doubt it will be to many people), we hope that people and politicians there will campaign for decent national basic incomes to boost them up to the standard of living they have come to expect. ​And if $10 buys more in some countries than others, that is likely to be no bad thing - usually countries with low prices are also countries where people don't have much money. If these people feel the benefit especially of their world basic income, so much the better. Why campaign for only a survival basic income? With world population at 7.5 billion people, this level of world basic income would require funding of $75 billion per month plus administration costs. This is a large, but not unfeasible, amount to raise from the global income streams we discuss. A sudden introduction of very large amounts of cash into areas that previously had very little could constitute an economic shock, which may trigger uncontrolled inflation if the supply of goods cannot keep up with the new level of demand. This could actually harm people on low incomes, if the prices of goods went up more than the amount of their basic income. Introducing basic income at a moderate level makes this less likely, and gives local producers and markets time to adjust. Many people struggle with the idea of us ever 'getting something for nothing'. Although at World Basic Income we believe that we are all owed a share of the world's wealth, others - rich and poor - may disagree and may consider a full or partial basic income to be morally unreasonable. However, hardly anyone thinks that people deserve to die of poverty if they don't manage to find a well-paid job, or that the children of low-income families should grow up hungry. We do not wish to impose a high level of basic income on a potentially unwilling world; therefore we prefer a survival basic income as it is the 'lowest common denominator'. Most people agree that it is a good thing if at least a basic level of support is provided, as a safety net for us all. Although pilot schemes for world basic income may be funded through international aid or charitable giving, we envisage that in the long term a whole-world basic income would be funded through new global mechanisms, which would aim to harvest a share of the of the wealth that our ancestors have built up over the centuries, and that the earth yields now. This could be gathered through collective shareholdings in global companies, international taxes, such as a carbon tax or financial transaction tax, royalties on goods like intellectual property or the extraction of natural resources, or fees for the use of shared goods, such as charging airlines a fee for using our shared airspace. These are relatively new ideas, and here at World Basic Income we are under no illusions as to how difficult they may be to put it in place. Nevertheless, we believe that it is right to gather up wealth at this global level, and that this could bring huge benefits if shared out as a world basic income. We will work to research the options, initiate discussions and push forward progress, to find sustainable ways to fund it. Immense amounts of wealth flow around the world every day. The world's Gross National Income - the total wealth we produce each year - is around $76 trillion. We need to re-direct only a tiny part of it - around 1.2% - to fund a world basic income. In doing so we take nothing away - we simply divert a small part of this income flow directly into people's pockets. Once people spend their basic income, this money is of course returned back into the global wealth stream to be earned, sold, and to flow round once again. There are lots of world resources that we could considered to be shared, either because their value is created through our collective efforts, or because they exist naturally without human effort. We could divert a small share of the income produced by these collective and natural resources to fund a world basic income, so that everyone in the world benefits from this collective wealth. A collective share in global corporations. Thinkers such as Yanis Varoufakis have proposed funding basic income by requiring that a percentage of the shares sold via Initial Public Offerings be held by a Commons Capital Depository. A proprotion of the diviends paid out to shareholders by companies would then accumulate in a collective fund which would be distributed to everyone wouldwide a a basic income. This idea recognises the fact that corporations make money partly through the use of ideas, people and infrastructure that have been publicly funded or are collectively owned, therefore the public deserve a share in the proceeds. Our money, and the real value within financial products. Hight finance only works if traders haec 'confidence' in the products being exchanged. To create confidence, products have to originate in the real economy of useful things. Currencies and bonds get their value from the fact that populations go out to work and pay their taxes. Derivatives ar based on farmers actually growing food next year, and on real earning people taking out mortgages on real homes. Without our hard work, the immense wealth within the fincance sector would disappear, so it seems fair to ask that a portion of this wealth is shared among the people of the world that helped to create it. Our atmosphere and the right to pollute it. Many proponents of basic income propose a 'carbon tax', which recognises that, just as waste authorities have to pay for landfill sites to dump solid rubbish, it is reasonable to also charge for the right to dump CO2 in the atmosphere. This tax would overwhelmingly fall on well-off people and corporations, as they use most of the world's fossil fuels. Our oceans and airspace, and the right to travel through them. Transnational shipping of goods, and aviation, are huge industries which rely on the use of these immense shared resources. We as the world's people could choose to charge for passage or freight through our airspace and oceans, and share this money out amongst us all. Our land. Most of us either have no access to land or we spend our lives renting or paying off the huge cost of a tiny parcel of it. Owners of large areas of land could be required to contribute a proportion of the revenue they generate with it (in rents, agricultural produce or capital gains) to the world's people, in recognition that we all have a shared moral claim on the land. The riches beneath the land. Gold, diamonds, oil, iron and other minerals all occur naturally yet they are traded for vastly more than what it costs to extract them. Although it may be unjust to begin extracting global dividends from these resources now, when the world's best off countries got rich centuries ago from selling theirs freely, these are nevertheless resources that can be considered to be common property at least by the people who live in areas where they still exist. There may be socially just ways to accrue a fair dividend from their extraction. Energy from the wind, sun, rivers and waves. As energy prices rise, landowners who happen to possess windy hills, or who can stake a claim to sunny deserts or fast-flowing rivers, may make a fortune by selling us the output of our own weather. Although these are benign energy sources and their development should be encouraged, in time it may become right to gather a share of their revenues for humanity. Riches from space. Near-earth asteroids contain valuable minerals, and some companies are already lining up to mine them. As no one privately owns asteroids, it seems reasonable to consider them to be in shared ownership. Therefore some or all of the gains from asteroids should surely be shared among the people of earth, just as the people of a country (or their government) usually expect a share of the proceeds from mining beneath their lands. Other riches from space, including space itself and the right to keep satellites there, could be treated the same way. Intellectual property, and the making of money from it. The fortunes made by Bill Gates and others programmers, writers and inventors were only possible because many people had built up knowledge before them, often for little or no pay. Our ancestors created this immensely valuable store of knowledge together, and we all deserve to share in the bounty created from it. How much could we raise for a world basic income? As described above, there are many more sources from which we could derive all or part of a world basic income. We can choose to tap into these stores and flows of wealth as much as the people of the world consider to be appropriate. But it helps to have numbers, and we at World Basic Income will work hard to provide them. Based on current research, the following proposed taxes give an idea of the scale of funding we need to provide the $900 billion per year that we need - enough to fund a $10 a month basic income for all of us. ​Carbon tax - Based on current levels of carbon dioxide output (circa 35 gigatonnes per year), and a suggestion by the IMF of a '$59 per tonne of CO2' carbon tax, over $165 billion could be raised every month, which is more than double the amount we would need. A collective share in corporations - The BBC reported in 2015 that global dividend pay-outs had reached $1.167 trillion in the last year. If 10% of those dividends were diverted into a Commons Capital Depository, this would raise $116.7 billion, enough for about one and a half month's world basic income each year. If the people's share in corporations was raised to 20%, this could cover three months of basic income, and if 40%, half of each year's world basic income could be funded in this way. Financial transaction tax - Estimates vary as to how much could be raised: The Institute for Development Studies found that $26 billion could be raised a year just by taxing foreign exchange transactions, while taxing other financial products as well 'could raise much larger sums'. A report to the IMF by a coalition of organisations concluded that $150 billion could be raised a year immediately. A United Nations working group concluded that around $80 billion could be raised each year with very tiny transaction taxes. These amounts are variable - however, it looks like around one or two months of the year's world basic income could be funded by a financial transaction tax according to current proposals. Taxing wealthy people - The economist Thomas Piketty has proposed a very low rate wealth tax on those with net assets above $1 million, and a higher rate for even richer people, which could bring in 'a few hundred billion dollars a year'. Such a tax could therefore fund a few months' of world basic income. Royalties on intellectual property - Peter Barnes, author of With Liberty and Dividends For All calculates the money that could be raised just within the USA, if a 20% tax (similar to the UK's Value Added Tax) were applied to the sale of patented or copyrighted goods within the 15 most patent- and copyright-intensive industries. He finds that $320 billion could be raised each year in this way. If we assume that the whole world's sales of intellectual property goods is five times that of the USA, and reduce the tax to just 2%, this would raise $160 billion per year, which is enough to pay for more than two months of world basic income. These amounts are just the tip of the iceberg. If we add to these the royalties that could be charged to companies on the mining of minerals and space resources, the land value taxes that landowners could pay, and fees that could pour into our shared account from the use of our oceans, airspace and atmosphere, the amounts we could raise could be enormous. There is no shortage of money - trillions of dollars change hands every day on world financial markets, and the world's billionaires alone have assets worth over $6 trillion. Ultimately, the amount that can be raised for a world basic income depends on public opinion and political will. How did they become rich anyway? Some of the funding mechanisms that we support at World Basic Income would impact disproportionately on rich people. This is no accident - here at World Basic Income, we believe inequality is a problem both because it is unjust and because it causes hardship and social problems, so we want to reduce it through progressive redistribution. We believe that you don't become a millionaire just by working hard - most people work hard, and yet never become rich. You need the workers in the companies you own (or invest in) to work hard too. You need producers of raw materials to work hard, so they can sell them to you at a price that turns you a profit. You need the world's farmers to work hard, so that you and your workforce can exist at all. You even need the world's unemployed people to keep on scraping by, to help keep your workers' wage demands in check. At World Basic Income, we believe that rich people and businesses only managed to get rich because millions of us helped them along the way. ​Although the world economy tends to direct money up the economic pyramid, it doesn't mean it belongs there, or should stay there. It seems perfectly reasonable that a small, regular share be taken from these accumulations of wealth to give back to the people of the world.